The longing for spring is universal. It transcends age, culture, geography, and even species. And it’s just around the corner! These fiction picture books will get young readers excited about the arrival of spring. A sublime picture book captures the long, anticipation-filled wait for spring and the moment it culminates in sudden realization that spring has finally arrived. 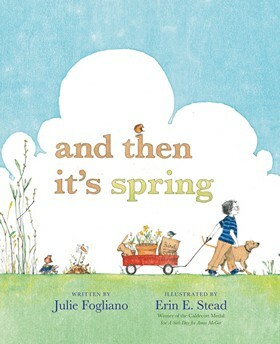 Julie Fogliano’s spare, fresh, lyrical writing is paired with Erin E. Stead’s delicate, whimsy-filled illustrations depicting a young gardener planting seeds and then waiting and hoping. Days turn into weeks: “and the brown, / still brown, / has a greenish hum / that you can only hear / if you put your ear to the ground / and close your eyes.” Despite this careful observation, the boy still misses the moment when spring sneaks in and transforms the landscape: “and you walk outside / to check on all that brown, / but the brown isn’t around / and now you have green, / all around / you have / green.” Humorous details enliven illustrations that show a brown, muddy landscape that is ultimately transformed to vibrant green. CCBC Category: Seasons and Celebrations. 2012, A Neal Porter Book / Roaring Brook Press, 32 pages, $16.99. Ages 3-7. Twenty-six short poems describe aspects of the season of rebirth and renewal with subjects that are sometimes pleasingly familiar and sometimes surprisingly fresh. 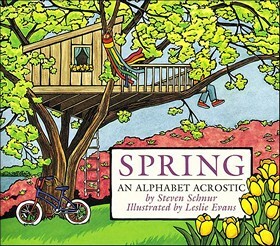 Many readers will get the immediate connection between spring and poem topics such as April, Buds, Kites, and Seeds, but among the more original offerings are Dawn, Hopscotch, Ladder and Venus, and Umpire is sure to bring a smile to some. Each poem is an acrostic, in which the first letter of the lines can be read vertically to spell out whatever is being described, and in each the connection to the season is made lyrically clear. Colored type is used to set the vertical word apart from the rest of the poem. Each page features a single boxed poem set on a richly colored, bordered linoleum cut. 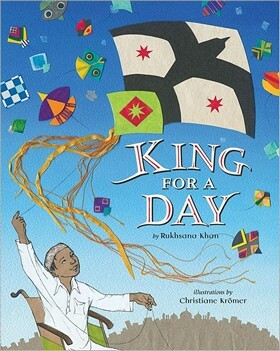 The handsome design is given even greater unity by the artist’s depiction of the same family and diverse group of children throughout the illustrations of this book that is sure to inspire some poem-making among readers. CCBC categories: Seasons and Celebrations; Concept Books; Poetry; Seasons and Celebrations. 1999, Clarion, 32 pages, $15.00. Ages 7-11. 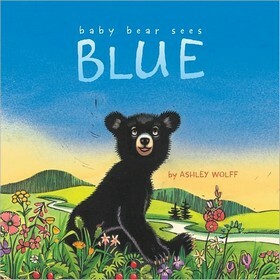 We explore the colors of his world with Baby Bear and his mother after he wakes in his den. First, with the glow of the sun, he sees yellow. In the dancing oak leaves outside, he sees green. When he hears the blue jays call, he sees blue. He sees the brown of the splashing trout in the river. When they climb into the meadow, Baby Bear smells and sees the red strawberries. Tickled by a butterfly, he notices orange. A rumble of thunder warns them to hurry home; the sky is gray. Later, when the storm is over, from the mouth of their cave they can see all the colors in a rainbow. Then it’s time to curl up together and go to sleep. Baby Bear closes his eyes, to see black. 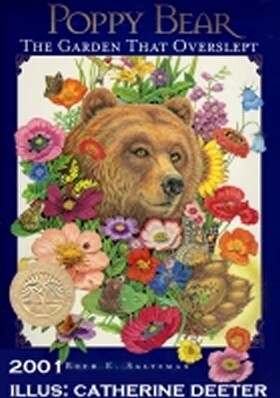 The double-page scenes identify the colors while simultaneously depicting the bears’ natural environment. Wolff prints linoleum blocks in black, then hand colors them with watercolors to design a detailed, naturalistic, bucolic setting with masses of colorful flowers, butterflies and birds along with a curious, frisky cub and its attentive mother. 2012, Beach Lane Books/Simon & Schuster Children’s Publishing Division, $16.99. Ages 3 to 6. The creators of Stranger in the Woods, a bestselling photoessay spotlighting animals in a wintry forest, set this impressive follow-up in springtime. The primary focus is on a newborn fawn, first seen sleeping “in the tall grass on the north edge of the meadow where the trees start the forest.” Other animals, photographed in stunning close-ups, wonder if the fawn is lost, but the creature responds, “Mama said to wait, to wait right here…. She will come back.” A brilliantly hued cardinal, downy goslings, a well-camouflaged tree frog, a dragonfly perched atop a turtle, a meadowlark and a baby raccoon (hanging precariously by its front paws from a log) are among the crisply photographed critters offering comments and encouragement to the fawn. The doe does indeed return to check on her offspring—and eventually to take him with her. (The back flap copy explains that newborn fawns spend most of the first two weeks of life without their mothers, since her scent will attract predators to her young.) The animals’ conversation is often endearing and lends itself to reading aloud—but it is the book’s breathtaking photography that will cast a spell, not just on children but wildlife aficionados of any age. Ages 6-10. 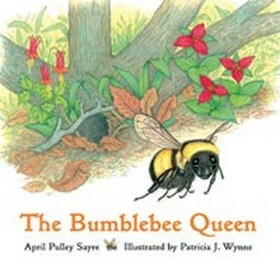 The Bumblebee Queen is a captivating picture book for children ages 3-8. Scientifically accurate illustrations reinforce the lyrical prose. It’s an ideal motivator for a child’s first exploration of life cycles, structure and function, or habitats. Beginning in spring, the story tells how a bumblebee queen digs out from below ground and flies in search of flowers from which to drink nectar. The queen looks for a place to nest in the ground and makes a waxy honey pot for storing nectar to eat on stormy days. Next she lays eggs that soon hatch. The larvae eat pollen and grow until they spin cocoons. The queen bee continues to collect nectar, gather pollen, and lay more eggs. Soon the new bees emerge from their cocoons. The new workers gather nectar and pollen and feed the larvae. In the fall, the new queens follow the drones and mate with them before finding a place in the soft earth to dig down and overwinter. All the other bees stay above ground where they cannot survive. Patricia Wynne’s delightful illustrations show the differences between the queen, worker, and drone bees, and the text explains the job of each type of bee. Facts printed in smaller text scattered throughout the book supplement the illustrations and written text for the adult who is working with the younger readers. The book supports National Science Education Content Standards for structure and function and life cycles. Additional bee information, books, and websites are provided in the back of the book for the interested reader. What a pleasure it will be to share this artistic, informative book with children of all ages! Grades K-4. Keywords: Animals, Insects, Nature Study. 2005, Charlesbridge Publishing, 32p, $14.95. Ages 5 to 10. This magical tale starts out with black-and-white pencil drawings of two children searching for signs of spring in their garden. What they discover is a big bear sleeping amongst the fallen leaves. The two soon find out that this is no ordinary bear. Poppy Bear has pockets full of springtime! As he and the children spread flower seeds and awaken the animals, the pictures also bloom with vibrant color. Fiction. n/a. 2001, Beyond Words, Unpaged, $16.95. During the spring festival of Basant in Lahore, Pakistan, our narrator young Malik looks forward to launching his kite Falcon in the traditional kite-flying battles. He particularly wants to settle accounts with the bully next door. His sister helps him launch his small but speedy Falcon. Malik manages to snap the strings of both of the bully’s kites. Then he flies Falcon to conquer many others. The downed kites then belong to whoever catches them when they fall. His brother and sister collect many. Malik truly feels like King of the Kites. Then, with one kind gesture, he brings his successful day to a happy end. Kromer uses mixed media and collage to create a striking and successful visual story, with the kites providing the major visual impact. A double-page scene of the flight from the rooftop with close to a hundred brilliant kites being guided to cut others free is most powerful. The naturalistic illustrations also inform us about the streets, houses, and clothing. The final double-page night scene from the rooftop showing the sky full of stars and exploding rockets makes a satisfying ending.2013, Lee & Low Books Inc,, $17.95.Ages 4 to 8. It is spring and the snow is melting and the sun is shining and the earthworm is moving in the earth and a seed is also ready to wake up. It is sprouting and the ladybug is spreading its wings because it is spring. The rabbit is wakened by the ladybug who claims it’s spring and the rabbit with one eye opened looks a bit askance but after twitching his nose “to smell the Spring air. He thumped to the bird up in her nest.” The red cardinal in turn woke the tawny striped cat who nudged the dog who in turn spread the word to the baby in her crib. The little one shared the good news with her brother and sister and before you could blink an eye, they roused their parents and everyone went outside. 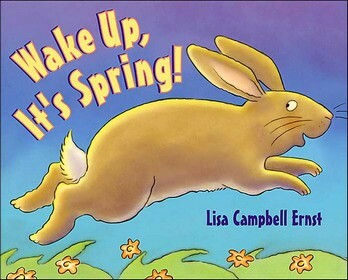 “And they all ran to dance together in the sun….because it was SPRING!” A delightful celebration of this time of rebirth, by an author/artist who creates illustrations full of joy and fun that will surely appeal to young kids. 2004, HarperCollins, $15.99 and $16.89. Ages 3 to 8. The eye-catching cover of this cheerful homage to the coming of spring features a splendid close-up of chubby toddler feet happily stuck in “gooey, gloppy, mucky,/ magnificent mud.” “One night it happens,” Ray (Pumpkins; Shaker Boy) begins mysteriously. 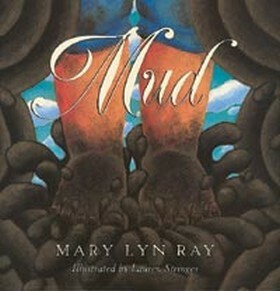 “…Someone opening/ a door will notice:/ earth comes unfrozen.” Stringer, in her auspicious picture book debut, portrays a solitary child viewing the brown leaves that “loosen/ from their frozen drifts and run/ rattling in the flapping wind,” then playing in a gigantic mud puddle (“Stir it. Stick it./ Dig it. Dance it”). The reader sees the child’s yellow boots and red socks give way to muddy toes and a single, full-length portrait of the child almost flying through the inviting springtime air. The bold acrylic paintings burst from their full-bleed spreads like tulips, with skewed perspectives and scalloped, abstract designs representing the grass and clouds. If not in the same league as e.e. cummings’s famous “mudluscious” tribute to spring, Ray’s brief poem nevertheless captures the joy of seeing winter “Squish Squck Sop Splat Slurp/ melt in mud./ Happy mud.” Ages 3-8. 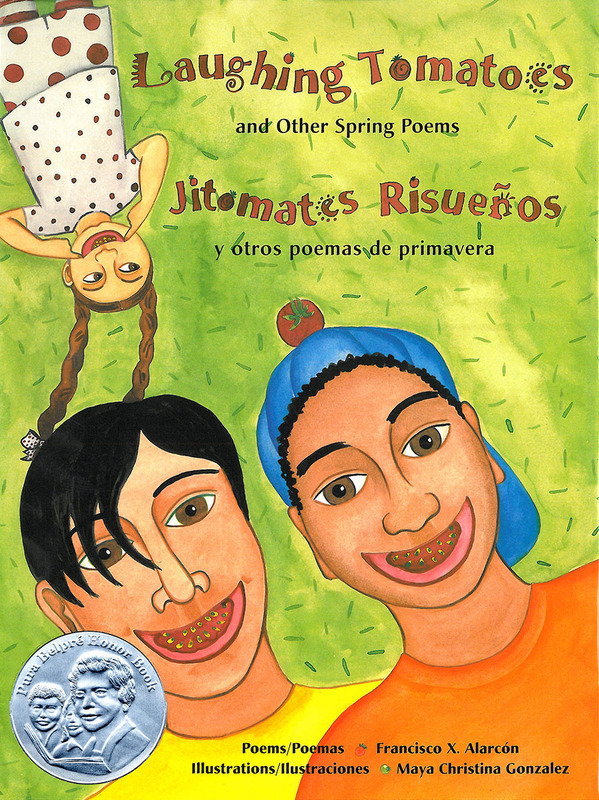 Seventeen poems celebrating spring, each appearing in both English and Spanish, run riotously across the pages in this energetic collection. Every double-page spread seems to have something to shout about, from “Dew”/”El rocio” (“the fresh/ taste/ of the night”; “el fresco/ sabor/ de la noche”) to “Las canciones de mi abuela”/”My Grandma’s Songs,” from “Strawberries”/”Las Fresas” to “Sueno”/”Dreams.” Sometimes the poem in Spanish is first, sometimes the poem in English, but the language is concrete and immediate every time, and it’s enriched by celebratory visual images. Gonzalez’ watercolors extend Alarcon’s poems, each double-page spread replete with blossoms, suns, dancing children, singing grandmothers, and fields bursting with corn, strawberries, and, of course, tomatoes. While the compositions are often crowded, sometimes uneven, and frequently unsubtle, the palette is bright with lavenders and pinks, and individual compositional elements have a joyful sense of magical realism that includes grinning portraits, tomato smiles, and floating chiles. Alarcon includes an Afterword/Posdata that talks briefly about poetry, the poems in this collection, and how he came to write them. The book opens with the words “A Poem/ makes us see/ everything/ for the first time”; “Un poema/ nos hace ver/ todo/ por primera vez,” and this collection certainly proves the point. R–Recommended. (c) Copyright 1997, The Board of Trustees of the University of Illinois. 1997, Children’s Book Press, 32p, $15.95. Grades 2-4. An exuberant little duck expecting spring weather is disappointed to find a frozen pond. Her feet stick to the ice as snow falls on her head. The bears tell her she has arrived too early and advises her to go back. Ignoring this kindly advice, the shivering little duck tucks her head under her wing. She shuts out the miserable cold around her, choosing to remember the joys of spring and warmer weather. As she pulls her head out, she is delighted to see a flock of ducks flying toward her. At the same time, she hears evidence of the spring thaw. The large print text features a rhythmic pattern with repetitions of three words throughout. Williams’ watercolor art perfectly captures the emotions of the small duck. Cold winter weather and joyous spring adventures burst forth from the pages in colorful detail. 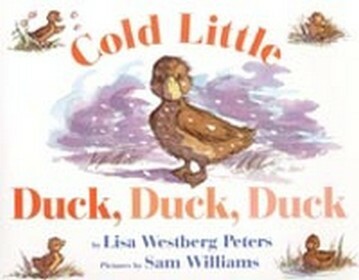 A great read-aloud for young children. 2000, Greenwillow Books/HarperCollins, $15.95. Ages 2 to 6. For more springtime titles, see our “Science of Spring” book list from 2014. What are your favorite celebrating the arrival of spring? Let us know in the comments below!